Telluride and the Mountain Village combine not only the best of Colorado, but what is probably the best second home location in the United States. Experience the breathtaking scenery, exciting recreation, history, cultural activities, summer and winter festivals and fine dining all in a world-class resort. In a stunning secluded setting in the Mountain Village, this home overlooks 105 acres of open space and Telluride’s 18-hole championship golf course – the highest and most beautiful course in America. Wilson Peak, one of the most photographed mountains in the country, is your backdrop. The complimentary Dial-a-Ride provides quick access to anywhere you choose to go within the Mt. Village or to the town of Telluride. •	-Spacious Family Room with 53 inch HD TV. •	-Newly constructed darling stone guesthouse with full kitchen, HDTV. This house has unmatched charm and privacy and will accommodate another couple. IF YOU ENJOY THE FINEST QUALITY SURROUNDINGS AND APPRECIATE TASTEFUL DESIGN IN A PEACEFUL SETTING - LOOK NO FURTHER, CALL OR EMAIL TODAY. THIS IS A NEW LISTING! MULTIPLE HOMES AVAILABLE!! CHECK FOR DISCOUNTED LAST MINUTE PRICING AND AVAILABILITY. Great separation of space which works well for two families. Master Bath is beautiful with 2 skylights and jetted tub big enough for two. Mt. Village and the Historic Town of Telluride are linked by a Gondola that is a spectacular experience and is complimentary too. ski-in, ski-out cross country trails right outside your door. We stayed here with six adults and two babies, so we did a lot of cooking at the house. The one issue I had was how very sparsely the kitchen was equipped, and that the kitchen range pulled away from the wall each time you opened the oven door. Having said that, the house was in a great location and the spaces were very comfortable for our group. This was the perfect house for us. We traveled with our 13 month old, our best friends (another couple) and my mother. We all had private rooms and private bathrooms, (we had the Master suite upstairs which is amazing, has its own fireplace and it's King Bed was the most comfortable bed we've slept on in years). This place is gorgeous, we loved our view and how quiet it was. Every day we called the FREE shuttle to take us up to ski. Mountain Village is fantastic, great shops and some nice restaurants. We rode the Gondola down into Telluride one day and that was so beautiful. (also free!) The Butcher and Baker restaurant in Telluride served the best Foie Gras we've had, better than what we ate in Paris. The house is warm, inviting and cozy yet still sophisticated. We cannot wait to go back - no matter what season. When we return to Telluride, we hope to stay here again and again. 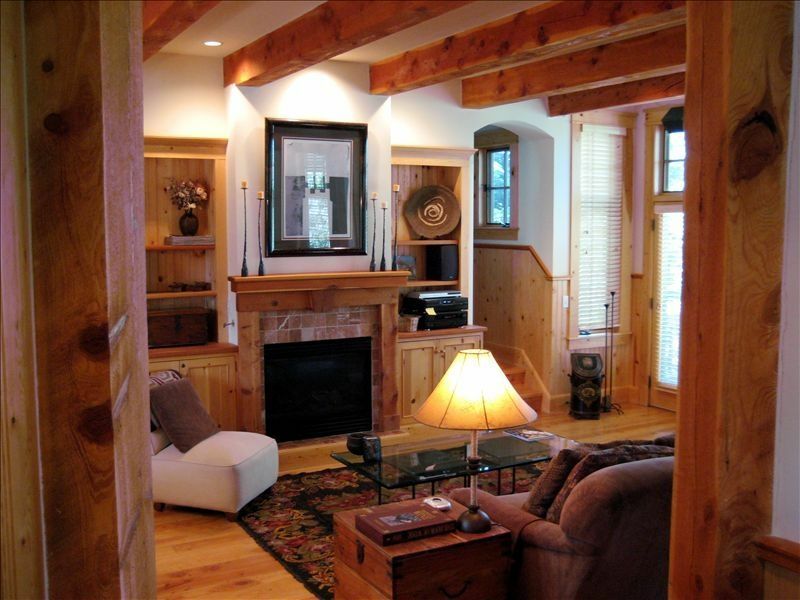 This home is large enough for a family but we enjoyed the cozy atmosphere all to ourselves. Wonderful master suite with steam shower and great big fluffy king sized bed in the beautifully appointed bedroom with fireplace and pretty morning views. Lot's of light from large windows, a deck perfect for Happy Hour, a second fireplace in the living room with very comfy furniture and a well appointed kitchen made for a beautiful stay. We will certaily look forward to a return visit. Close to town and close to hiking trails but far enough away to enjoy the solitude of the mountains. We loved staying in this house! It was beautifully appointed,and extremely warm and comfortable. It has everything you need in the kitchen and in every room…the master bathroom is particularly large and lovely. We liked the open floor plan, large windows, and beautiful views of the trees. We were here in the summer, which was great for hiking, restaurants, shopping. We hope to return again, and would absolutely recommend this house to friends. Love the summer in Telluride!! My family and I had an amazing stay at this house in the Mountain Village. We could not have asked for a better trip. There were 2 couples plus 2 kids and we have more than enough room. The house felt like your own home. Everything was clean and nicely decorated. The kitchen had everything we needed to make meals at home when we wanted to stay in and BBQ on the deck. The master bedroom was a great size, with a Jacuzzi tub and steam shower! When we wanted to leave the house we were picked up by Dial-A-Ride and taken to the base of the mountain, where we could shop or take the free gondola into town. We didn't have to drive our car once! The views from the house are breathtaking. On a clear day you can see all the way to the mountains of Utah. We can't wait to come back! pilates, yoga, spinning and other fitness classes as well as indoor and outdoor pool, hot tubs and steam and sauna rooms available through our private membership at the Golden Door Spa just minutes from our home. PAYMENT TERMS MAY BE SCHEDULED. DOGS ARE CONSIDERED. DISCUSS WITH OWNER.